Posted on November 4, 2018 by David M.
This Wednesday we lucked out. Foreboding gales paused and the sun came out for a perfect fall day. The nor’easter of the weekend had brought the ducks. While there were a few early ones, this was like a great big atmospheric dump truck had unloaded our winter’s share of seabirds and ducks, all at once, on Plum Island. As we gathered in the lobby of the Education Center, there was a raft of Buffleheads and another of Common Goldeneyes floating off of Joppa Flats. Then it was on to Plum Island, and after stopping at the salt pannes for some American Wigeons, Greater Yellowlegs, and one Dunlin, we arrived at The Warden’s to search for sparrows. While another lone birder drove away the many birds foraging in the gravel by the sheds, we did find Clay-colored Sparrows and both juvenile and adult White-crowned Sparrows among the many Dark-eyed Juncos and Song Sparrows. A Ruby-crowned Kinglet and an Eastern Phoebe entertained us briefly, and throughout our search, Yellow-rumped Warblers occasionally joined the sparrows, flitting butterfly-like down to the ground from the weeds and shrubs they normally would forage in. Next we drove all the way south on Plum Island, to Emerson Rocks. Clots of sparrows and juncos continued to line the road, scattering as the first vehicle approached. The pile of cobbles and boulders that is Emerson Rocks was fully exposed. A Sanderling and a couple of Semipalmated Plovers dotted the wide sand flats. Everyone’s first field seen through binoculars and spotting scopes was filled with birds. Scoters of all three species ranged up and down the shore, some fairly close and many way out. One of us immediately saw four Red-throated Loons, another Common Eiders, another a Red-breasted Merganser. 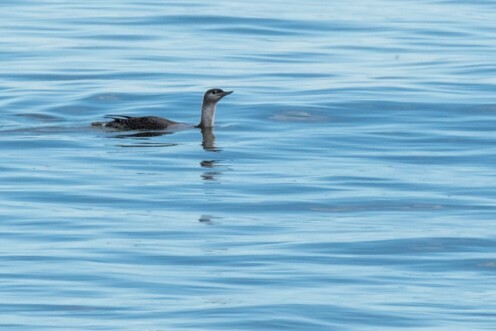 Common Loons, Long-tailed Ducks, and Horned grebes were scattered all over the ocean. Northern Gannets rowed, more than soared, through the calm, clear air. What a moment to have all the winter seabirds we love so much to arrive at once and in such abundance! 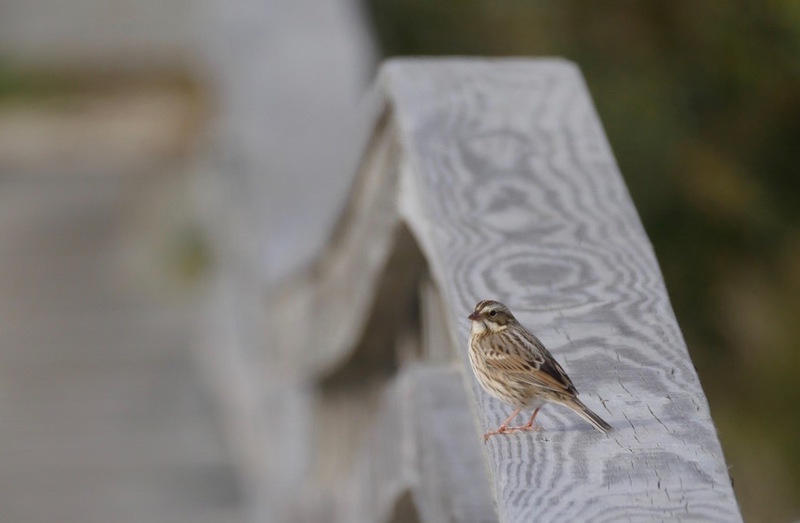 Remembering to turn around to check for passerines, a largish, stripey sparrow appeared right away, working its way toward us in the sand and on the boardwalk. 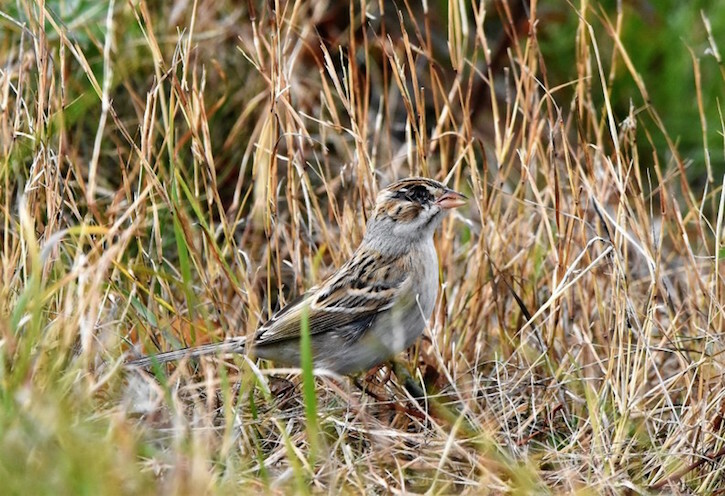 This Ipswich-type Savannah Sparrow was quite clearly larger and lighter than typical Savannahs. After lingering for a good long time viewing all those recently arrived seabirds, we returned north to Hellcat Observation Area. 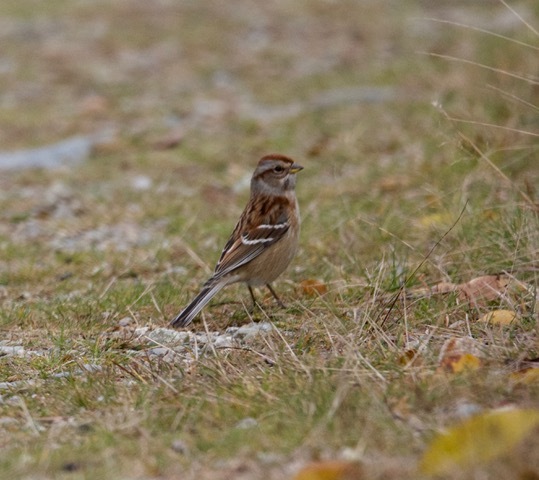 The dike was fairly quiet, but the interesting sparrows that we found at The Warden’s were present there as well. There were lots of dabbling ducks at the other end of Bill Forward Pool, mostly Green-winged Teal, with a few Northern Pintails, American Black Ducks, and Mallards thrown in. A Cooper’s Hawk soared in a perfect little thermal that may have been generated by the Hellcat parking lot, hardly needing to “flap-flap-flap” during a long, circular glide. In the marsh to the west of North Pool dike, we found a small panne with a little flock of Gadwalls, and an American Pipit flew by relatively unobserved by many chatty birders. A pair of Hooded Mergansers played hide-an-seek in a tiny pool, sometimes giving us nothing more than a flash of white hood. We could just make out Bonaparte’s Gulls and Buffleheads way out on Plum Island Sound. Just as we thought we were in trouble for adding a Northern Harrier to the list, a beautiful juvenile flew by, slowly demonstrating the lilting, agile search pattern that results in enough voles caught to survive winter on the marsh. On our way off the dike, an American Tree Sparrow popped up along the road, the winter’s first for many of us. At least one of us drove back to the Education Center with a bit of a “horse heading to the barn” mentality, missing a big flock of shorebirds on the “Hay Marsh” – the stretch of salt marsh along Sunset Drive that was recently mowed and harvested. The short grass has made that stretch an ideal foraging area for big flocks of Dunlins, Black-bellied Plovers, and others that we have been observing there. Our beloved mentor, Dave Weaver, was cognizant enough to glance over to at least notice and take some quick looks at the many birds that were there. Once again the great marsh and island served us an incredible array of beautiful birds, our earth’s miraculous way of transforming earthbound reptiles into the sublime descendants of dinosaurs we so love today. Canada Goose (~ 15) – various. Mute Swan (2) – ads; first seen from Hellcat dike flying north over Plum Island Sound, and then seen on the Main Panne. 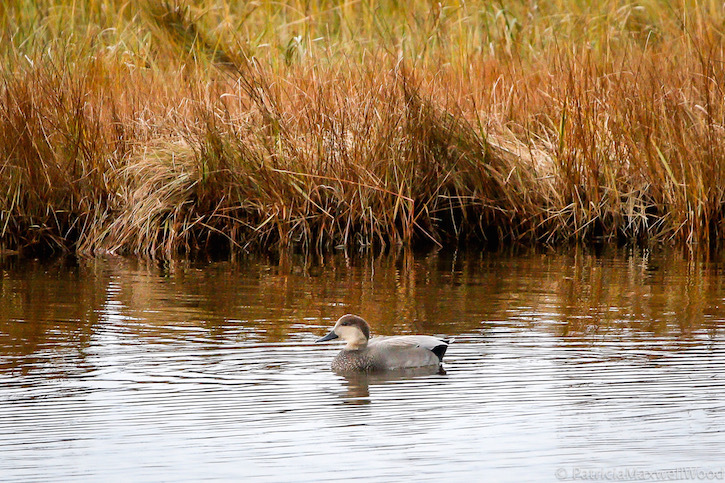 Gadwall (8) – marsh west of North Pool dike. American Wigeon (~ 20) – Main & small pannes. Northern Pintail (5) – Bill Forward Pool (BFP). Green-winged Teal (~ 60) – BFP. Common Eider (3) – Emerson Rocks. Surf Scoter (2) – parking lot #7 (seven), ocean. White-winged Scoter (~ 200) – seven ocean. Black Scoter (~ 30) – seven ocean. Long-tailed Duck (~ 35) – seven ocean. 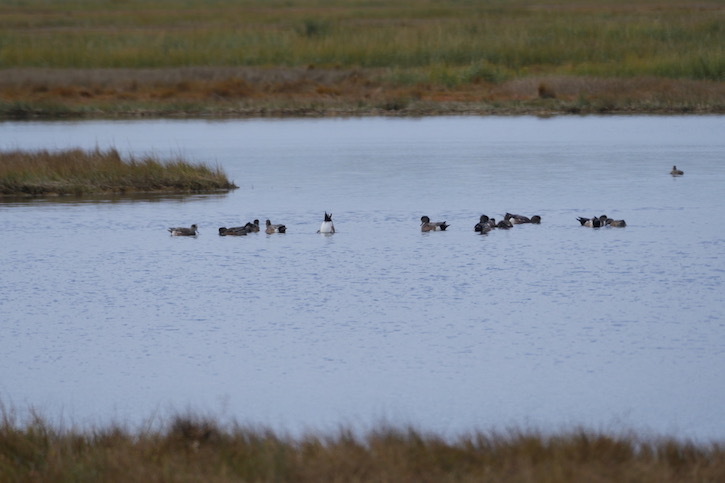 Bufflehead (~ 15) – Plum Island Sound. Hooded Merganser (2) – marsh west of North Pool dike. Red-breasted Merganser (1) – seven ocean. Red-throated Loon (~ 12) – seven ocean. Common Loon (2) – seven ocean. Horned Grebe (6) – seven ocean. Northern Gannet (3) – seven ocean. Double-crested Cormorant (~ 35) – various w/ one small flock of 7 over seven ocean. Great Blue Heron (1) – North Pool from Hellcat dike. 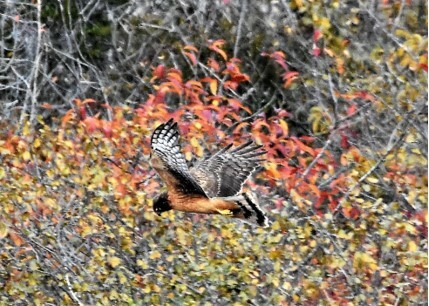 Northern Harrier (1) – 1st year, flying over North Pool marsh. Cooper’s Hawk (1) – flying over dunes east from Hellcat dike. Black-bellied Plover (~ 27) – 2, seven beach; ~ 25, Hay Marsh. Semipalmated Plover (2) – seven beach. 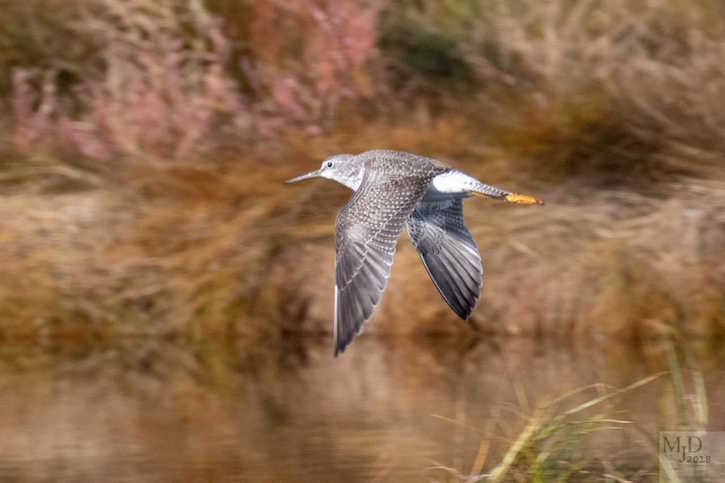 Greater Yellowlegs (3) – small pannes. Sanderling (1) – seven beach. Dunlin (~ 300) – Hay Marsh. Bonaparte’s Gull (6) – Plum Island Sound. Great Black-backed Gull (4) – seven beach. Eastern Phoebe (3) – 1, S-curves; 1, The Warden’s; 1, Hellcat dike. American Crow (5) – over marsh w. North Pool dike. Ruby-crowned Kinglet (1) – The Warden’s. Northern Mockingbird (4) – various. American Pipit (1) – fly-by, Hellcat dike. American Tree Sparrow (1) – Hellcat dike. Chipping Sparrow (3) – 2, The Warden’s; 1, Hellcat dike. Clay-colored Sparrow (3) – 2, The Warden’s; 1, Hellcat dike. Savannah Sparrow (1) – probable Ipswich; seven dunes. White-throated Sparrow (1) – roadside. 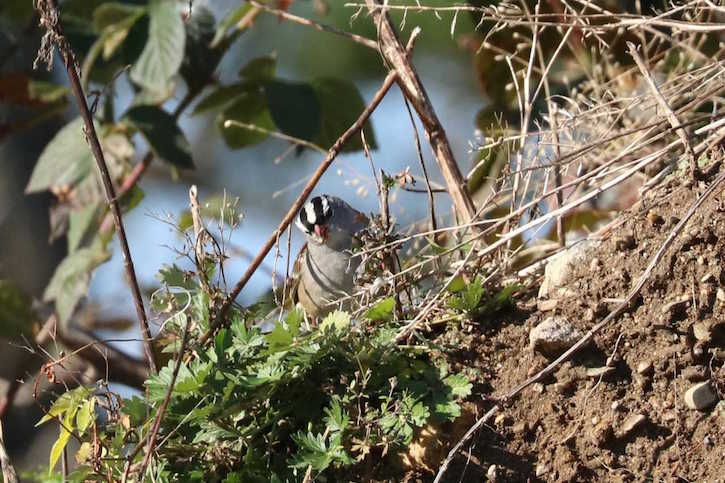 White-crowned Sparrow (4) – 2, The Warden’s; 1, Hellcat dike; 1, seven dunes. Northern Cardinal (2) – Hellcat. This entry was posted in Birding on November 4, 2018 by David M..